Conveyor Rails adjust without tools. Adjustable, 2-axis side rails, for low-profile conveyors, allow pre-setting of 2 different positions for rapid changeover times. They include lane dividers and overhead hold-downs. UHMW-guided cross block controls height and horizontal position of ½ in. diameter steel bar, to which side rail is mounted. 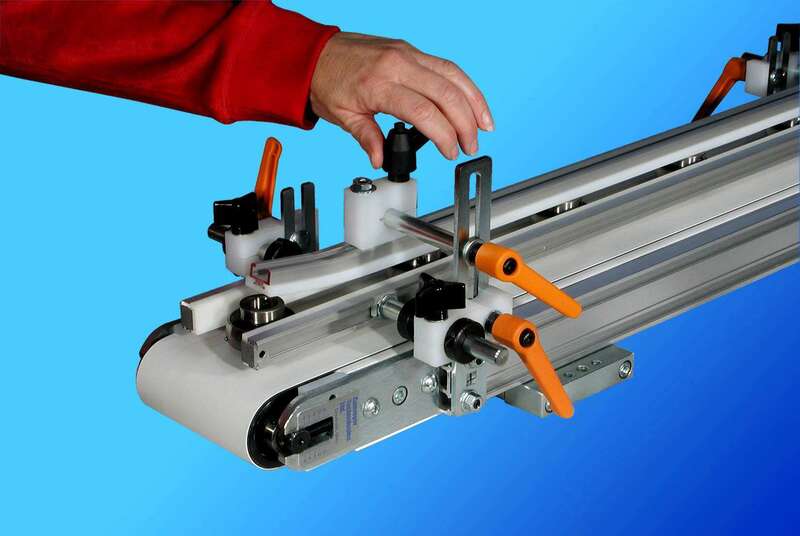 Guided and clamped cross-block mount eliminates misalignment and binding. All side rails have UHMW liners to protect parts and reduce side drag. Lockable stops allow presets of two side-rail positions. Guided cross-rail support improves rigidity, parallelism and ease of changeover. January 2003 – Conveyor Technologies Ltd. has developed a new system of two-axis, quick-adjustable side rails for its line of low-profile conveyors that allows pre-setting of two different positions for rapid changeover times. The tool-free-adjustable system is universal to the company's entire range of low-profile conveyor, and includes lane dividers and overhead hold-downs as well. The low-profile conveyor is ideal for automation of work-cells, packaging machinery, stamping lines, electronics assembly, and similar applications. The quick-adjustable system is designed for exceptional rigidity and simple, positive operation. The side-rail design uses a UHMW guided cross block to control the height and horizontal position of a one-half-inch-diameter steel bar to which the side rail is mounted. The guided and clamped cross block mount eliminates misalignment and binding caused when a cross block is mounted on a vertical round shaft. A lever and knob are used to lock the positions of the cross block and rail. This design holds vertical position while adjustments are made, without the need to re-clamp until all adjustments are complete. Lockable stops on the cross rail allow pre-setting two horizontal positions for the side rail, which can then be changed by loosening the knob. All side rails have UHMW liners to protect parts and reduce side drag, while providing full belt width range. Overhead hold-downs and lane dividers for the system adjust without tools as well, and both are UHMW-lined, too. The new side-rails, hold-downs and lane dividers are part of Conveyor Technologies modular low-profile line which consists of 14 designs, including end-drive, center-drive, magnetic, vacuum, and AccuMove precision timing belt conveyor.